Thousands of Hong Kong citizens protested across the city on Monday, blocking roads and prompting the closure of banks and schools, as they stepped up their calls for democracy. 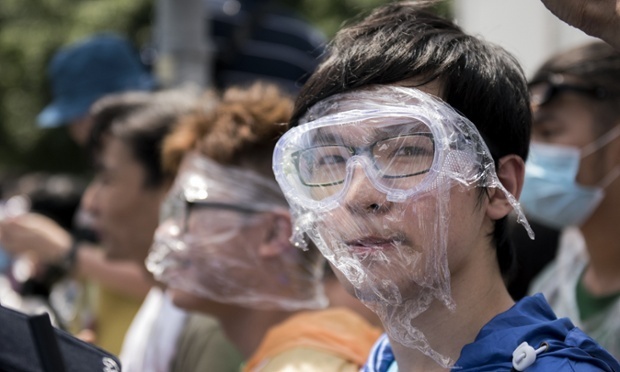 Police attempts to use teargas to clear huge protests from Admiralty and Central in downtown Hong Kong late on Sunday backfired by spurring more people to take to the streets, with numbers peaking in the tens of thousands. Fresh protests sprang up in Causeway Bay and Mongkok, in Kowloon. Parts of the financial hub, generally known for its orderliness, were paralysed by the demonstrators. The government announced on Monday morning that riot police had been taken off the streets as citizens “have mostly calmed down” and urged people to unblock roads and disperse. Hong Kong enjoys considerable autonomy under the “one country, two systems” framework and has long been promised universal suffrage for the election of the next chief executive in 2017. But protesters are furious that the rules announced by Beijing will impose such tight controls on candidates that a democrat could not even stand. They see the decision as part of a broader attempt to tighten controls on the region. The non-violent civil disobedience movement was expected to start on Wednesday, a public holiday. But it kicked off at the weekend after students who had been running class boycotts invaded the government compound at Admiralty, which police had blocked off. The organisers spent months planning Occupy Central with Love and Peace, but it has now taken on a life and perhaps a name of its own. Some dubbed it “the umbrella revolution” in reference to the umbrellas that sprang up over protesters’ heads each time they feared a tear gas or pepper spray attack. “This is a watershed,” said Hung Ho-fung of Johns Hopkins University, noting that in the past mass protests had occurred with police approval. In previous cases where mass protests against Chinese government’s plans have led to them being dropped – such as 2012‘s plans for compulsory “national education” – the decisions have formally been made by the Hong Kong leadership. This time, the framework for reforms was announced by the standing committee for Beijing’s National People’s Congress. Beijing is explicitly tied to it and cannot portray a shift as a decision by the Hong Kong government. Hung predicted that China would use loyalists to mobilise the counter-argument, with people warning of the need to prevent chaos. In some parts of the city, commuters cheered protesters. But Agence France-Presse reported angry confrontations in Mong Kok between the activists and people annoyed by the disruption. More schools have gone on strike – students had already announced that last week’s class boycott was now an indefinite campaign – and the government decided to close schools in the Central, Wanchai and Western districts. Several banks closed branches, many businesses were shut and about 200 bus lines suspended, the South China Morning Post reported. Officials said 41 people, including police, had been injured since protests began and 78 arrested for offences including forcible entry into government premises, unlawful assembly and obstructing police. Occupy Central and others appear to be prioritising the demand to oust CY Leung, the highly unpopular chief executive. That seems a more achievable outcome than rolling back the electoral reform plans, but since the protests have taken on a momentum of their own, uniting all those on the streets may prove difficult. In a statement, Occupy Central said Leung’s refusal to enter direct dialogue with people had driven Hong Kong into a crisis of disorder, which would be defused by his resignation. NextLAPD Cops are Disabling Their Own Recorders. Not Just a Few Cops Either, Half of Them!